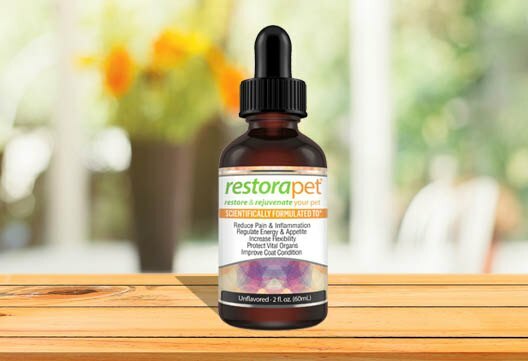 RestoraPet and RestoraPet Hemp are our line of organic, non-GMO, veterinarian-approved products designed to maximize wellness at any age and to visibly improve quality of life for dogs, cats, horses, and other warm-blooded mammals. Our proprietary product blends are the result of more than 10 years of research and begin working from the very first administered dose to protect and heal your pet at the cellular level. A breakthrough blend of 12 antioxidants along with EPA and DHA, each bottle also contains 50 milligrams of Vitalitrol®, a remarkable carbon-based antioxidant that begins working from the first administered dose to rehabilitate and protect every cell in your pet’s body, visibly improving quality of life. Effects include quick and dramatic improvements in activity level, playfulness, appetite, coat condition, flexibility, and a significant reduction in pain. Give it to your pet once daily, preferably in the morning, directly by mouth or mixed with his or her preferred food. Available in unflavored, bacon and beef. The world’s only full-spectrum hemp supplement blended with a synergistic dose of Vitalitrol®, turmeric, CoQ10, and black pepper extract for maximum absorption, rapid results and total body wellness. Effects include decreased pain and inflammation, improved organ function, and decreased anxiety with a calm sense of well-beingGive it to your pet once daily, preferably before bed, directly by mouth or mixed with his or her preferred food. We specially formulated RestoraPet Hemp to complement original RestoraPet for maximum benefit. Available in unflavored and bacon. RestoraPet and RestoraPet Hemp were developed and engineered to be administered together, with both products being given daily long-term: original RestoraPet is administered preferably in the morning, and RestoraPet Hemp administered preferably in the evening. Together, this Combo Pack offers remarkable, maximum strength improvements in your pet’s quality of life. Reduces joint discomfort and pain, improves flexibility and mobility, provides a calm sense of well-being and relief from anxiety, regulates appetite, improves sleep quality, improves skin and coat health, and provides significant protection of all vital organs and cellular systems. Maintains wellness in younger pets. Offered at a significant discount for a subscription.